SBI Clerk 2019: SBI Clerk 2019 Official Notification for the post of Junior Associates (Customer Support and Sales) is released on the official website, sbi.co.in. According to the SBI Clerk 2019 notification, 8653 vacancies have been announced for the post of Junior Associates – Customer Support and Sales. SBI Clerk is one of the most sought-after jobs in India. It is highly prestigious and that is why lakhs of candidates apply for the recruitment exam of the State Bank of India. The SBI Clerk notification 2019 pdf is now available for download at sbi.co.in/ careers. In this article, we will give detailed information about SBI Clerk Recruitment 2019. Online registrations underway for SBI Clerk Junior Associates recruitment from April 12 – May 3, 2019. Apply online now! The SBI Clerk online application form 2019 is now available for online registration on the official website. For regular vacancies and backlog, aspiring candidates can check the official SBI Clerk notification 2019 pdf. Candidates can apply for the exam only in online mode. A recent passport sized colour photograph (4.5 cm X 3.5 cm) of the candidate in JPEG format; the size should be 20 to 50 kb whereas the dimension should be 200 x 230 pixels. Signature* in black ink on white paper. Left Thumb Impression* in blue or black ink on white paper. Handwritten Declaration* in English with black ink on white paper. *Signature, Left Thumb Impression and Handwritten Declaration should in JPEG format of dimensions 140-60 pixels and size 10-20 kb. 3rd Step: Click on the “Apply online“ link. 4th Step: On the redirected page, click on “Click Here for New Registration”. 5th Step: Enter your basic information like Name, Date of Birth, Email ID and Mobile Number to register yourself. 6th Step: A Provisional Registration Number and Password will be generated after you have submitted your basic information. Note them down. 7th Step: The same will also be sent to you via your registered email ID and phone number. 8th Step: Log in with your Provisional Registration Number and Password and edit the particulars, if necessary. 9th Step: Enter your Personal, Academic and other details. 10th Step: Upload scanned copies of your Signature, Photograph, Left Thumb Impression, and the Handwritten Declaration. 11th Step: Make payment of the application fee. 12th Step: Click on “Submit”. 13th Step: Download and print out several copies for future reference. The application fee can be paid only in online mode through Credit/ Debit Cards and Net Banking. 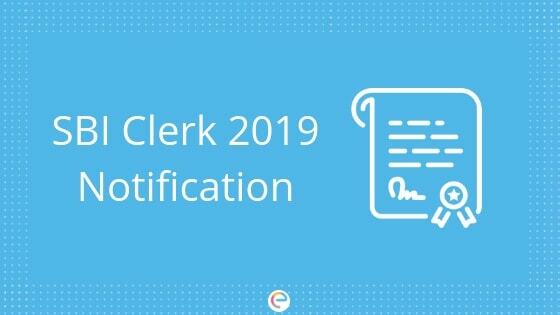 The SBI Clerk notification 2019 pdf has been released. The total number of vacancies is 8653. The designation will be Junior Associate (Customer Support & Sales) in clerical cadre in State Bank of India. Candidates can apply for vacancies in one state only. *Allowances may vary depending upon the place of posting. A candidate should not be below 20 years and not above 28 years as on 01.04.2019, i.e candidates must have been born not earlier than 02.04.1991 and not later than 01.04.1999 (both days inclusive). He/she must hold a valid graduation degree in any discipline from a recognized university. A candidate is required to be: a citizen of India/a subject of Nepal/a subject of Bhutan/a Tibetan Refugee who came to India before 1st January 1962 with the intention of settling permanently in India/a person of Indian origin who migrated to India from Pakistan, Burma, Sri Lanka, Kenya, Uganda, United Republic of Tanzania, Zambia, Malawi, Zaire, Ethiopia, Vietnam and have the intention of settling permanently in India. Ex-Servicemen/ Disabled Ex-Servicemen The actual period of service rendered in defence services + 3 years, (8 years for Disabled Ex-Servicemen belonging to SC/ST) subject to max. age of 50 years. The selection process will consist of online exam (Preliminary & Main examination) and test of specified opted local language. The marks of the Preliminary exam will not be considered for final merit listing. Provisional selection will be based on a candidate’s performance in the Main exam. Final selection will be based on document verification as well as the candidate’s performance in the Test of Opted Local Language. For every incorrect answer, 0.25 marks will be deducted. Candidates who qualify for selection and produce 10th or 12th standard marksheet/ certificate evidencing having studied the specified opted local language will not be subjected to any language test. In case of others (qualified for selection), specified opted local language test will be conducted after provisional selection but before joining. Candidates not found to be proficient in specified opted local language would be disqualified. According to the SBI Clerk notification 2019 pdf, the marks obtained in the Preliminary Examination will not be added for the selection and only the aggregate marks obtained in Main Examination will be considered for preparation of the final merit list. Provisional selection will be made on the basis of candidate’s performance in the Main examination. ii) Qualifying in the test of specified opted local language, where applicable, as detailed above. Results of the candidates who have provisionally qualified for selection will be made available on the official website. Wait List: A wait list of up to 50% of vacancies (State-category wise) will be maintained. Candidates will be released from this waitlist on a quarterly basis against non-joining and resignation out of the current batch only. This wait list will be valid for a period of one year from the date of declaration of final result. General English: Vocabulary, Synonyms, Antonyms, Word formation, Sentence completion, Comprehension – Theme detection, Deriving conclusions, Passage completion, Error detection, Passage correction, Sentence correction, Spelling – Grammar, Phrases, Idioms. Computer Knowledge: Ms Office, Windows Os, the internet, and emails, hardware etc. Quantitative Aptitude: Basic 10th 11th and 12th Mathematics including profit and loss, percentage, number system, averages, ratios and proportions, speed and distance, time clock, calendars, analogies and distance, ages. Reasoning Ability: Syllogism, Data interpretation, number series, blood relations, odd series, coding, and decoding, seating arrangement, Distance and Direction, ranking, Order and ranking, Making judgments, etc. The SBI Clerk preparation needs one to be very serious and methodical as you need to score as high as possible in order to guarantee your selection. Even though Prelims exam is just qualifying in nature, you need to prepare in a way that guarantees a high score because the same three sections of Prelims are there in Mains as well, and provisional allotment will be based on the marks secured by the candidates in the Main exam. Have a clear knowledge of the exam pattern and syllabus. Then finish each and every topic. Understand the theory behind the concepts and solve as many practice questions as possible. Develop reading habits as well. Go through a sufficient number of example problems before solving practice questions. Once you have finished the whole syllabus, take mock tests and then identify the areas you are weak at. Work on them and improve yourself. Also, improve your time management and question selection skills. The SBI Clerk admit card will be released separately for each stage of the exam. SBI Clerk Prelims admit card will be released for those who have successfully applied for the exam. For Mains, it will be issued only for those candidates who qualify in the Prelims exam. The admit card will be made available on the official website of SBI. candidates will have to log in to their account using their Registration Number and Password / Date of Birth in order to download their admit card. The admit card is an important document without which candidates won’t be allowed to appear for the exam. It will contain all the information regarding the exam and the candidate. a. Sectional SBI Clerk Cut Off Marks: The minimum marks candidates must secure in the individual sections of the exam. b. Overall SBI Clerk Cut Off Marks: The minimum total marks that candidates must secure adding the marks obtained in the respective sections. Candidates must clear both these cutoffs in order to get qualified in that particular round. The difficulty level of the exam, etc. As a result, the cutoff changes every year. We will update the cutoff once the exam is conducted and SBI releases the cutoff marks. SBI Clerk result will be declared separately for both the stages of the exam. It will be issued on the SBI official website. In order to view and download the result, candidates will have to log in to their account using their Registration Number and Password/ Date of Birth. In case of any problem in filling up the form, payment of fee/ intimation charges or receipt of call letter, queries may be made at Telephone no. 022-22820427 (between 11:00 AM and 06:00 PM on working days) or lodge his/her query on cgrs.ibps.in. Candidates are advised not to forget to mention ‘Recruitment of Junior Associate-2019’ in the subject of the email. We hope this detailed article helps you. For any query regarding this article or the exam in general, feel free to drop a comment below and we will get back to you.